First of all, don't let this post scare you off.  Yes, I mentioned before that the game can be very complex from a strategic stand point, but as you will see either through this article or by playing yourself, most of what I am going to tell you is actually pretty logic and ends up happening naturally as you get better at this game. That one of the positive aspects of playing competitively, there are not really tactics that are way better than others or specific moves you have to learn to be good. Of course there are aerials and wall shots and what not, but more to that later. What I am trying to say is, the whole game is purely skill based, the more you play, the more you learn, the better you get. At the beginning, your first hours playing, you start getting the hang of the mechanics, you hit more balls, you begin to pickup more and more boost pads. You may even start to learn how to do aerials, or at least manage to hit some flying balls. Pretty quickly you start to know how your car handles, how the physics of the ball work, double jumps to save boost and you even start to implement your hand brake into your plays. This is the point where I want to pick up and talk about the most important strategic elements you need to know in order to be a useful part of your team. Indeed, now that you know how to play the ball we are going to talk about what to do when you are not playing the ball, which is, in most cases, actually more important than anything else. Like the title says, positioning is key. This game is played by one single rule; the best defense is a good offense. If you don't let the opponent start a move towards your own half of the pitch you will score sooner or later and at the same time you are not letting them score against you. If you can keep the ball in their half as long as possible you will exhaust them, they will run out of boost and end up making mistakes that you have to be able to translate into a goal. Let me show you how. As mentioned before, the longer you play this game the more natural the following strategy will feel and you will notice that it's the only logical way to position yourself in relation to your teammates. People call this "Rotation", it is actually what happens but I'll explain later why I don't like that term. In this scenario Player 2 (P2) is the backup for P1, meaning he has to position himself to be able to react to two possible outcomes of a play made by P1; P1 either manages to center the ball, or a defensive player clears the ball. P2 has to be positioned in such fashion that he is able to react to both outcomes of P1s play. Player 3 (P3) isn't very active yet, because he is acting as the last line of defense. As soon as P1 ends his play either by centering or losing the ball, every red player has to reposition himself according to the new situation. Let's ignore the possibility of a successful center and discuss what would or should happen in the case of a clear by the opponent. 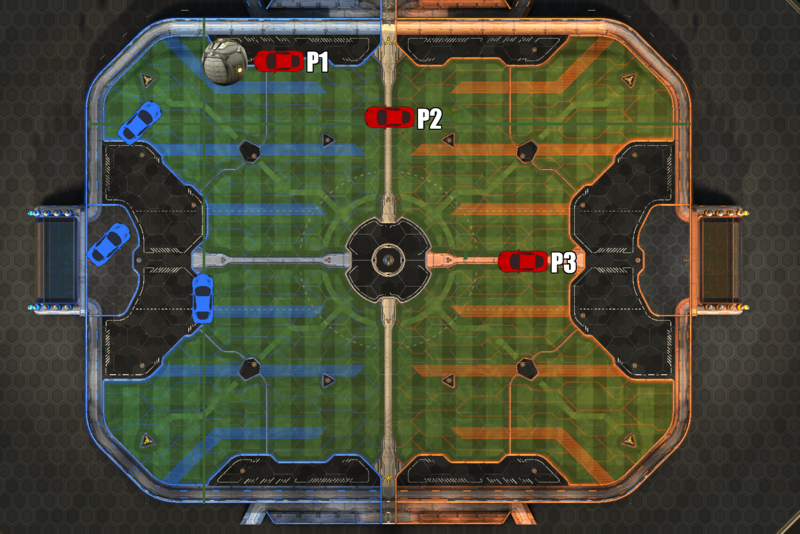 The blue player closest to the ball clears over P1, what now? I know this starts to look very technical, but bear with me. P1 is now out of the active play and has to back up, since he can't do anything useful from his position. P2 was his backup the whole time, so P1 doesn't have to bother about the ball anymore. At this time P2 is now the one playing the ball and since P1 is completely on the other side of the field, P3 ins now the backup for P2. If we take a short look at the blue team, the same happened there. You can see one player playing the ball and one being his backup. The blue player in net doesn't have to move because A) He doesn't want to disturb the player in the middle that is working as backup and B) When the ball is in your half, there ALWAYS should be somebody in net, more to this when we talk about goalkeeping. If now P2 manages to hit the ball into the corner, P3 will follow him at a reasonable distance. P3 is the backup now, so he again needs to be ready for either a center or a clear by the next opponent. This repeats itself in every situation, every place on the field. It's always one player on the ball, one backing him up and the third one repositioning himself according to the other two players. Back to why I don't like the term "rotation". As you have seen, the basic structure of this strategy relies heavily on communication between you and your teammates, right? Wrong. If you think about it, this is the only way to play effectively and it can be achieved without even talking to each other. There is no other way to be more effective than trying to predict what will happen with the ball next, and position accordingly. There's only one solution for every problem in this game. If your teammate is closer to the ball, you are the backup and you have to position accordingly. If you have the ball, play it as hard as you can to achieve that center or even shot on goal. If you whiff it, your teammate will be in a way better position than you to hit the ball, he was prepared for it, so get out of the way. Don't just drift back and slam aimlessly into the ball, you are probably facing your own goal by now, how can hitting the ball into your own half be a good decision? Think about that. In the past picture, do you think P1 should boost right back into the ball? That can only go wrong. What I'm trying to say is that if everybody knows how to position themselves correctly, the rotation happens automatically. 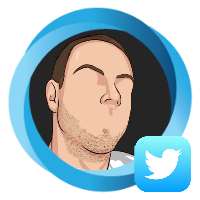 In my opinion, it sounds like rotation can only happen if you play with two friends on Teamspeak, when in reality it works perfectly with randoms without voice chat, as long as they follow the basics of positioning of course. Now this is a very basic explanation of how the system works and how you should think when approaching a certain situation. We all know that every round of Rocket League is different from the next one but the example I showed before happens pretty frequently doesn't it? Positioning is key, if you are always at the exact location where the ball is going to land, your opponents wont even be able to take a shot on your goal. Okay so this section is more for the beginners or semi-pros, mostly because there's not much of a tactic behind the face-offs but still, there's some stuff to mention. In 3v3s, if you are the furthest player back, you stay in net, that's it, and you don't get out until the ball is out of danger (in the gif above the red goalie was probably able to clear that shot). When playing with randoms use your quick chat, either to tell them what you are going to do or know their intentions by reading the chat. 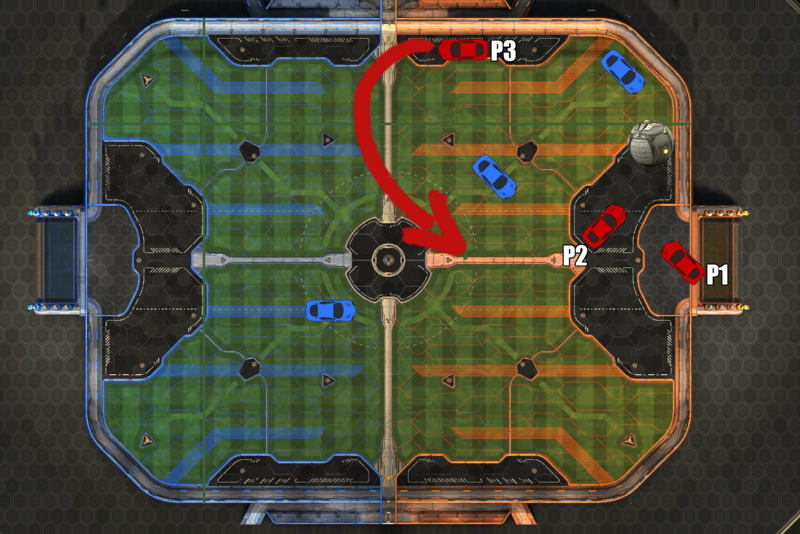 In a 3v3, if they go, you have basically two options; you either jump backwards to get the corner boost or you cheat. It's called cheating when you slowly follow your teammate so if the ball stays in the middle after the face-off, you can quickly hit it and maybe even get a shot on goal. That's what I prefer to do, more often than not the ball ends up in their half giving us the advantage. In a 2v2 I can only tell you what I personally do. If I'm in front of the net I stay back, if I start on the side I cheat. And I don't really need to say this, if you are the closest to the ball at face-off, you go. What to do when you are the one going for the face-off is something you need to find out by yourself. Me personally, I like to boost straight into the ball and dodge forward in the last second, so the roof of my car hits the ball. This reduces the chances of the ball jumping over me. It usually flies either into their half, or pinches 90° away from the goal to the side boost. So you want to know about goalkeeping then, hmm? So first of all, there is goalkeeping, but there's no permanent goalkeeper so to speak (watch the positioning of P3 in the pictures above). Or at least there shouldn't be. You have to look at goalkeeping more like a normal play with its rotation and everything, but just on your last line of defense. I mentioned earlier that, as long as the ball is in your half, there should always be somebody in net and, in the case of a 3v3, two other guys trying to clear the ball out and over to their half. For the guy that is actually defending the goal line, the following three words apply. You are now the last player between the ball and the back of your net. You now are only allowed to make the right choices, everything else may end in a sarcastic "What a save" from the other players. This is another example of a fairly typical situation you will encounter yourself in, let's take a look at what is happening and how it should unfold. 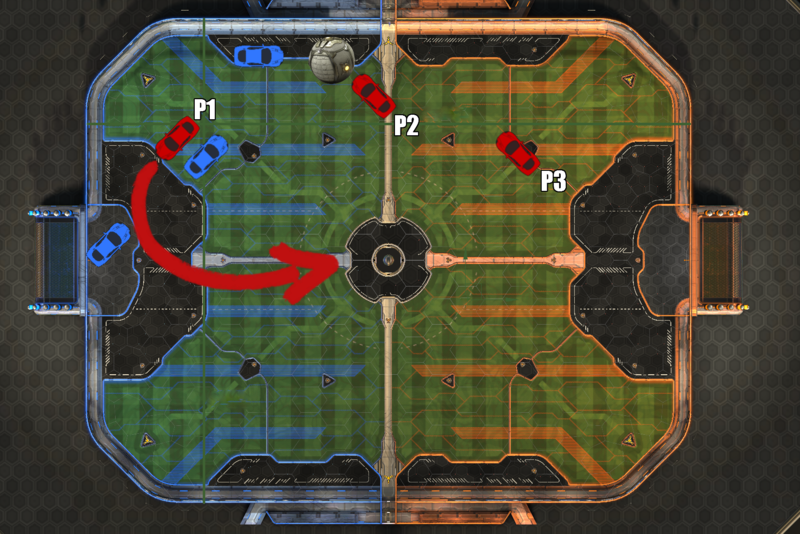 So here blue is attacking red, this is what would happen in the example I used before when talking about positioning, if P1 would have managed to center the ball. The first thing we see here is that blue managed to center the ball, after shooting past P3, that now decides to grab some boost before rotating back to help his teammates (which in some cases is a pretty clever decision, his teammates may run out of boost if the ball stays in reds half for too long). The last blue player is way back and wont interfere much in this play. So now we have a 2v2 in front of reds goal, blue in the corner is being aggressive and his backup is getting ready to receive the center shot. From this top view it's pretty clear that P2 should go for the block/clear here, but once you are experiencing this live and under stress lower tier players tend to just hit the ball hoping the clear will work. Correct play: P2 goes for the block/clear while P1 holds the line in goal. The ball either flies over blue and P2 can keep playing it, or the ball hits blue and flies across the goal into the other corner. If it flies upwards P1 is positioned correctly and can try to clear it. Note here: Never clear weak shots towards the middle, see that 3rd blue player? He's waiting for that. Yet by that time P3 should be back in order to help where needed. Bad play: P1 and P2 go for the ball at the same time. No matter what the outcome is, the second and the third blue player would now be in front of an empty net, and P3 is way to far away to assist in net. This should never happen. Specially considering that (if P1 doesn't bump P2 away) a two player pinch is very difficult to predict, not mentioning the blue player and the wall. What does this mean? Patience. You have a teammate in front of you, let him do the work, you still can react if P2 misses the clear. Wait up until P3 comes back, or just anticipate where the ball is going and try to cut a pass when you're sure you'll hit it. Talking about hitting, do the goalkeeper training. I'm telling you, it helps A LOT. This will teach you and make you confident enough to stay in goal in certain situations. I've seen it a lot that the last guy behind just rushes out of the net trying to get to the ball in mid field and either coming to late or just being dribbled out easily. If the opponent is closer to the ball you've got better chances letting the ball come to you than being the aggressor. If you are not sure you can make it to the ball, you can always play it safe and stay in net, a simple double jump can cover the whole net up to the top so you don't even need boost. The rest is anticipation - reaction - patience. Here I tried to explain and illustrate which should be the thought process on decisions in the most common situations you will find yourself in. Now you know where to be in what situations and why it is the most ideal solution, so you now can apply this to mostly any decision making during a game. Do you find yourself chasing the ball or just drifting in circles because you can't hit it? Maybe you remember that a teammate should be close for help and you can actually just leave, grab some boost and get back into the action. Maybe this opens your eyes a bit more and you start looking around to know where your teammates are, thus getting a better positional awareness and play to its advantage. Maybe you already knew all these things and you think i wasted your time here. Maybe in an other dimension i am a waffle. All in all this is the base for a solid Rocket League strategy, the rest is skill. Play, play and play even more, you will find your strengths and weaknesses. Talk to people in ranked and add them to your friends list if you had fun with them. So for goalkeeping the last scenario would you say that P3 after grabbing boost should go straight to goal and releave P1 and let him replace P2? Or do you recommend P1 just stay in goal and let P3 replace P2? Personally I'd prefer P3 to go straight to goal, because P1 has a better angle at potentially clearing the ball when P2 whiffs, whereas P1 would be coming back at the wrong angle to clear the ball. Thoughts? Hi Achenar. You already took a very important factor into consideration, the orientation of your teammates. Situational awareness is crucial to take the right decisions. You are asking if P3, who went to mid field to get boost, should replace P1 in the goal, and I can't really give you a fix or universally applicable answer to that. It depends on what's happening on the field. If the ball flies over the net, P1 will probably leave the net because there's nobody else there and he can make a play without risk. In that scenario your positioning (as P3) would depend on what P2 does; if he's grabbing boost or is still laying on his roof you can go and follow P1 and cover his back, giving P2 time to recover. If the ball would have stayed in the right corner and P1 goes out, nobody is covering the net so the decision is easy, go net. If he doesn't and you have a chance to disrupt blues play, go for it, P1 is still between the posts. All in all, as I said, it depends on what each player is doing. You want to try to always have a guy in net as long as the ball is in your half. And what you mention about the angle of a clear, you always want to play the ball forwards, if your teammate has a better position, let him get it. If it's to dangerous, it's always safer to kick the ball to the sides than risk a goal. And my last piece of advice, if it gets tight, every little touch of the ball is a second or two you grant your team to get boost and rotate back. Even if you can't hit it well, in a panic situation even a shot that goes straight up gives your team those extra few seconds to reposition themselves. - imagine the field being split into two zones: left and right. Two players have to be in the zone where the ball is and the last player has to be at the halfway-line in a central position (your first pic). If the pass went too far for P2, P3 should move into that zone. So if the pass from P1 was coming from the right and goes too far into the left zone for P2 to catch, P3 should go there (because P3 has the shortest distance and best angle in that case) and either P1 or P2 has to secure P3s position. If you have teamspeak, you need one special command like "rotate!" that indicates that P3 has left the back open and someone needs to back up. - If P1 and P2 get outplayed and you're P3, don't contest the ball. Instead, drive backwards into your own goal and wait until the other players are ready. Otherwise, the opponents might have an open goal. - if two players are in the same zone contesting the ball, the goalie can stay at the far post. This is a bit risky, but if a pass from the opponents goes too far or someone clears it to the other side, the goalie can push that ball into the opponents half easily.